Algebra and edibles do not usually mix, but for Mark Wikar one is absolutely essential for creating the other. 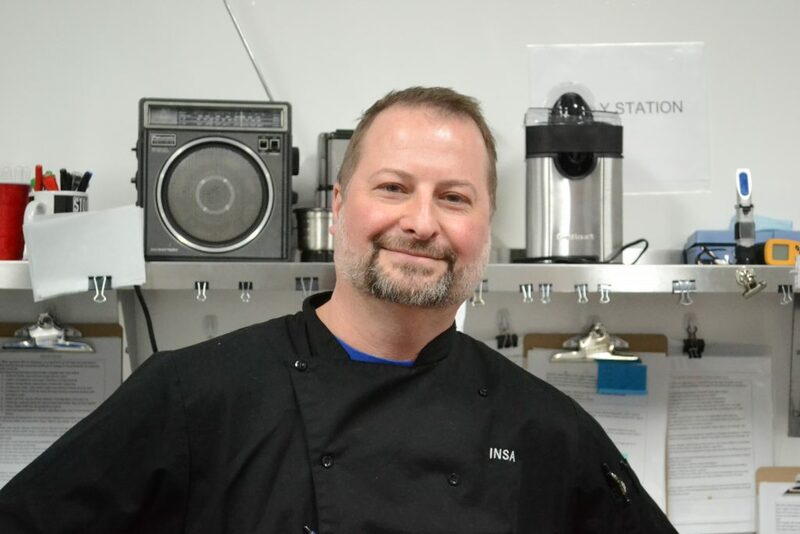 Even though his background is as a pastry chef, Wikar now uses a lot of math to create perfectly dosed edibles at INSA, a medical cannabis dispensary that opened in Easthampton this month. “My mom was a math teacher but I didn’t really pay attention,” Wikar joked. 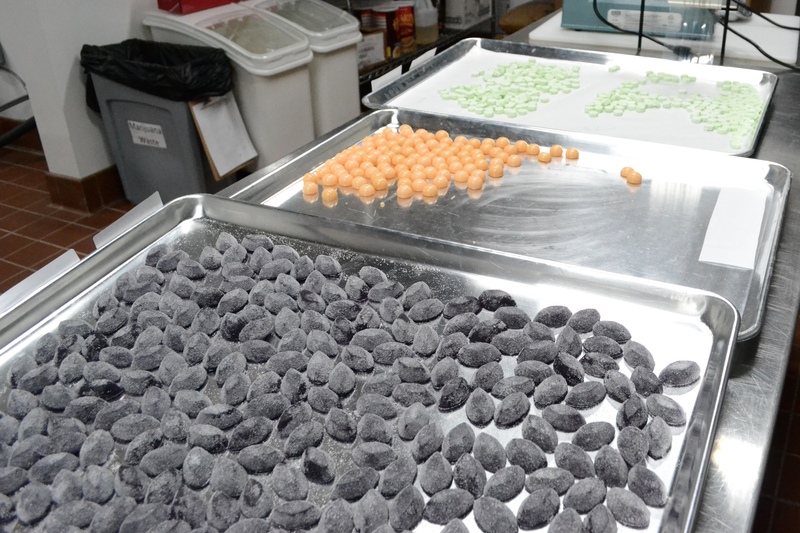 A variety of candies made by Mark Wikar in the kitchen at INSA in Easthampton. Photo by Meg Bantle. 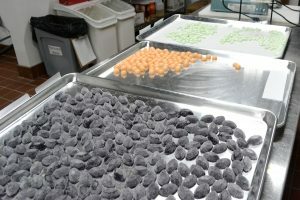 Wikar is the head of edible manufacturing at INSA where he makes a diverse line of medical cannabis edibles, including hard candies, mints, and chocolates. The edible products are made using a cannabis oil distillate, which is made in house using cannabis buds that are also grown in house. Wikar went to culinary school in Oregon and has been baking all over the country for decades. Most recently he was the pastry chef at the Log Cabin and Delaney House in Holyoke. He puts his pastry training to good use at INSA by using the cannabis distillate to create new and creative products that are then sold to medical marijuana patients in house. For instance, with maple season already underway in the Valley he is currently working on a hard maple candy. When I visited his kitchen last week the maple smell was just as strong as the smell of the cannabis, and the maple candies looked amazing — like shiny, amber marbles. I learned that the cannabis smell was largely due to Wikar’s kitchen being in a shared facility where cannabis is grown, processed, and sold, and less from the baking process itself. In fact, the distillate that Wikar now uses in his products has less of a cannabis smell or taste than other full-spectrum oils. Wikar said that it’s the distillate that allows him to create diverse products because it is not as limiting as a butter. Mark Wikar, head of edible manufacturing at INSA in Easthampton. Photo by Meg Bantle. Making the distillate itself is a complex process (that someone other than Wikar does at INSA), but the end result is essentially a tetrahydrocannabinol (THC) sap. By extracting the THC from the plant, refining it and decarboxylating it (something you can read about in a previous article) you’re left with a cannabis oil distillate that generally has a very high percentage of bioavailable THC. Wikar uses algebra to calculate the exact amount of distillate to use in each recipe. The formula Wikar uses is based on the company’s current policy of making edibles that have a single dose size of 5 mg of THC. For example, in a chocolate bar with 10 squares, each square would contain about 5 mg of THC and the whole chocolate bar would contain 50 mg of THC. Everyone’s metabolism is different, so 5 mg of THC could have a very different effect on different people. Mints preparing to be weighed at INSA. Photo by Meg Bantle. 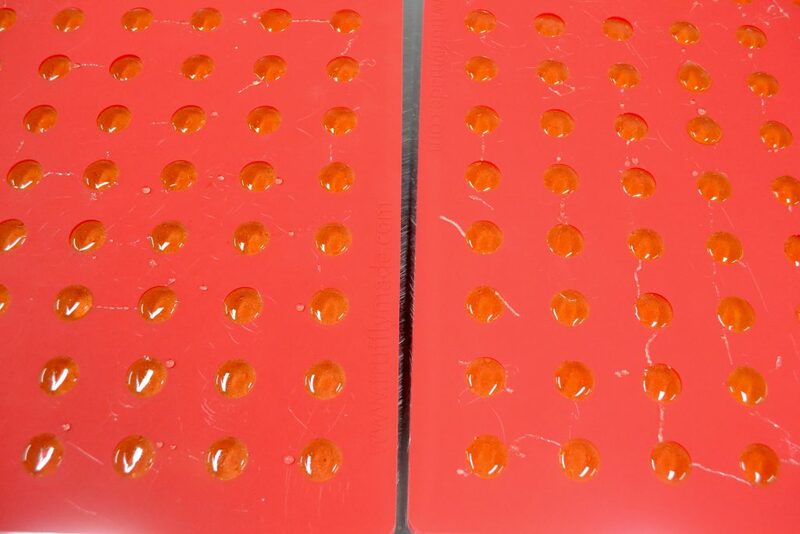 In order to get their dosing as accurate as possible, INSA sends the distillate to be tested before it’s used to see exactly how much THC it contains. INSA is required by Massachusetts law to send their products to be tested at an independent testing laboratory, so they use MCR Labs in Framingham. Once the percent of THC in the distillate is calculated, Wikar can use recipes that he has made and weighed to calculate exactly how much distillate he needs to produce a 5 mg dose. While that sounds like a lot of math, Wikar and Kelly both agreed that the system they have in place helps the process to be smooth and reliable. “We rely on a lot of experience and methodology that we know work,” Kelly said. 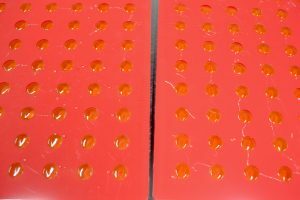 Hard maple candies in a mold in the kitchen at INSA in Easthampton. Photo by Meg Bantle. Wikar’s new job involves more paperwork than his other baking jobs because he has to meticulously keep track of each batch of edibles they move from the kitchen, to the laboratory to the store. 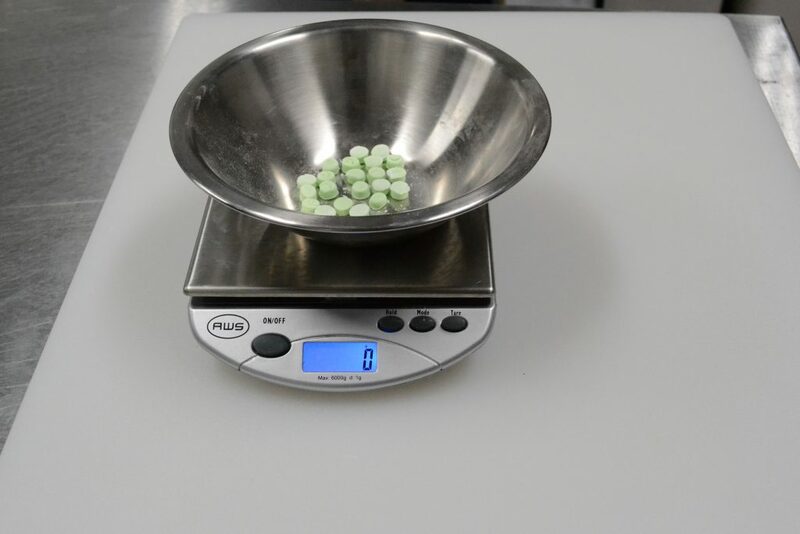 Once he makes a batch of edibles with the calculated amount of distillate, a sample from that batch gets sent to MCR Labs to make sure it is 5 mg per unit (allowing for a small margin of error). If Wikar’s math is wrong or his measurements are incorrect, the whole batch is wasted. Wikar’s advice for staying organized? With all of this math and regulations it might seem like there is little room to get creative, but Wikar had four or five different products in the works when I stopped in last week. He said that he regularly checks in with retail part of the dispensary to read feedback that customers leave about his edibles. Using customer feedback, Wikar can play with new recipes and seasonal flavors to create edibles that INSA customers are excited about. In addition to taste, Wikar also strives to create products that look impressive.